This table outlines the New Zealand Government's planned spending for the 2018/19 budget year. The numbers are drawn together from data released by the Minister of Finance on May 17, 2018. Links to the primary sources used, from Treasury's website, can be found at the bottom of the page. Click on any heading to drill down to what makes up these numbers. Figures for each allocation are in millions of NZ$. Am I missing something? According to the above figures we will spend less on Health than the previous year. and edited for stupidity, apologies, completely missed the far right column. that was an error on our part, which has now been fixed. AND just look at Social Welfare ............ almost as much as Health and education combined . That pesky Accommodation Supplement which is nothing more than a drip directly into Landlords arteries needs to be turned off . The largest Social Welfare cost - by far - is for NZ Superannuation. 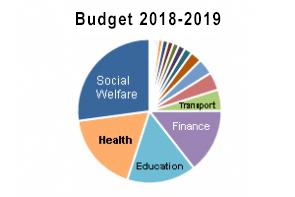 $14.5 bln or almost 60% of the Social Welfare budget. We will have drilldown detail up tomorrow. Woah, woah, woah David, we can't have that kind of chat, stop with your facts and stuff. Although Boatie is right, we do need to stop the landlord subsidies, I'm pretty sure their "hard-earned" capital gains that they've worked so hard for, should suffice without the need for further augmentation. $14.5B on superannuation that is crazy. err you could ask the pensioners for means testing (by and far the largest cost & majority of social welfare) but they would be pretty annoyed at any reductions. They might even stage a protest, not online but the sort of sit in types. Anybody know what is covered under the line "Defence" and what is covered under the line "Defence Force"? I watched the pitch this afternoon but we really need the numbers to understand what is going on. Didnt hear a word this afternoon about the $500 million added to the tertiary sector, hope its not a bailout for those loss making polytechnics.